Take a look at the chart and large arrow below. It’s an update of what we showed last month, but is worthy of a repeat as it illustrates that the market has steered towards valuations that are not out of sync with interest rate cuts. Why? Typically when the 5-year trades more than 20 basis points rich to the curve, the Fed is often cutting rates (or engaging in QE). Does that mean that the next move in the Fed funds rate is down? Not necessarily. The jury is still out on the extent of slowdown risks. We don’t anticipate an imminent recession (at least not in the next two years), and the re-steepening of the yield curve (especially on the 10/30yr) supports that notion. Also, market yields are still above the Fed funds rate. These would typically trade below the funds rate ahead of actual delivery of interest rate cuts. The 2-year is sitting just above the funds ceiling at 2.5%. 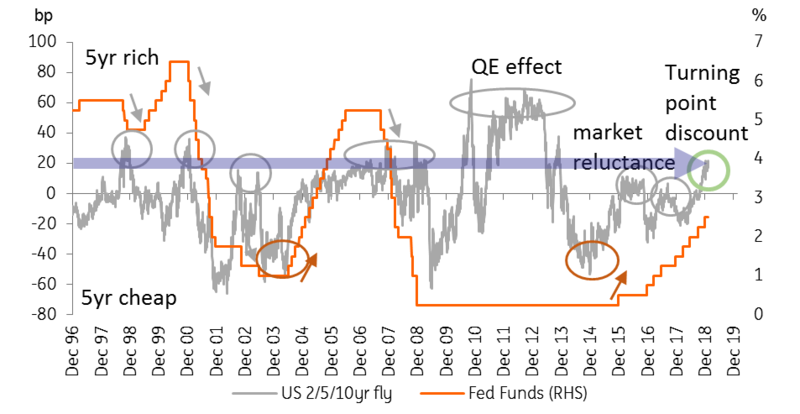 History shows that even the 10-year would trade through the funds rate if cuts were seriously being contemplated. The market discount is finely balanced though. Market probabilities do not contain a conviction view for the coming year. But after that, the bias is more towards a cut than a hike. The medium-term discount sees the funds rate settling in the 2% to 2.25% range, an implied cut of 25 basis points from current levels. We can agree with the medium-term discount, but the balance of risks still points to a residual rate hike risk later this year (see the US macro section). That is where we identify alpha versus the forwards, and we note that the ongoing rally in risk assets points in the same direction; the Fed can also hike to push against this. We have identified a change in rates market psychology; it illustrates that rates are peering down. But we’d prefer to bet against this as a tactical view. Structurally there will indeed be cuts at some point down the line. But to accelerate towards this, a deeper deterioration in growth would need to materialise. It’s noteworthy that the current risk-on mood is implicitly pushing against this too. February Economic Update: Stick or twist?